While there are many different varieties of lettuce, picking good lettuce is pretty universal. Look for unblemished heads, with no brown or rust colored spots. Pick heads that are tightly packed and heavy in the hand. Make sure lettuce isn’t wilted and that it doesn’t have any slimy leaves (especially important with mesclun). Use a crisper lettuce like romaine or iceburg to use with more assertive, creamier or richer dressings and as a sandwich or burger topping. Softer lettuces like Boston, bibb or mesclun (pronounced may-cloon, not mescaline), need a lighter vinaigrette. Bibb and Boston lettuces make a great wrapper for food like chicken salad. 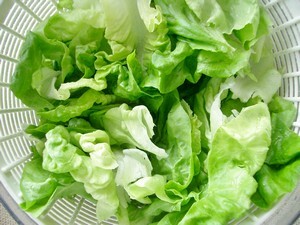 Wash all lettuce thoroughly, there’s nothing worse than gritty lettuce, and dry it on a towel or in a salad spinner. Store it in a plastic bag in the crisper drawer of the refrigerator. If you’re curious about the best storage for lettuce, check out my test of various bags.